Math can be a daunting subject for even the most seasoned veteran homeschooler. I can't count how many times I've helped parents overcome their fear of math. Math Essentials has taken some of that fear away with their No-Nonsense Algebra workbook. This book starts with a pre-algebra review, and progresses through the ins and outs of Algebra. Included with the book are free online video tutorials to help your child get the most out of this complete Algebra book. This could certainly be a full algebra course. This book is thick and full with practice work. Each lesson is broken down into short, and easy to understand components. I love that. It's easy to get lost in the process, but Math Essentials No-Nonsense Algebra takes that process and breaks it down into its smallest parts for easy understanding. Like I said before, this book is thick. I truly wasn't expecting it to be this full. I do wish there was more in the way of practice on each lesson. For example, on the picture below, I'd like to have another page just of that to use for practice, or even two pages per lesson. I think that would make for a much more comprehensive book. With that said, review is seen throughout the book, so previous lessons are reviewed, but I'd just like more review at the time. The pages have easy to understand and read instructions. There's no flashy stuff to distract your student. It's very straight forward. There's not a ton of empty space for use as a workspace, so you may need some scratch paper. I had Mr. B work on these first few lessons more because he had some issues with it. We used the included online video tutorial, and then I just hand wrote out some more problems for him to do to try and get more practice in. I wanted to make sure the "easy" stuff was solidly mastered before moving on. I thought I'd show some from the middle of the book, as well. This way you can see a little more. Each lesson is presented the same way. There's your actual lesson part, then the review. Some of this is very new to Mr. B, so I had him work at a slower pace at the start in order to lay down a solid foundation. You can see there is ample instruction and samples to see. Each lesson builds on the next, and your child reviews previous material all through the lessons. I really like these tid bits of encouragement or useful tips. These are interspersed throughout the book. It's a nice addition that allows your student to stop and pause, and think about what they are doing, and how. I can see these helpful hints being useful across the spectrum on schoolwork, not just with this subject and product. Overall, we plan to continue using this as a mix between a main core and a heavily used supplement. I like the layout of the book, and the fact it's not overly flashy and distracting. I'm not sure if we will fully progress into the main algebra part this year, since that's still a bit advanced for him. I like the shorter lessons that are more concise and easy to understand. I would highly recommend this to others, especially those whose children have trouble focusing for long periods of time. Does Math Essentials No-Nonsense Algebra Pass My 4 Ingredient Test? This a physical book, so there's no time constraints that you'd find with a fully online program. I would not skip ahead at all because the lessons build upon each other. It would be very easy to skip ahead if your child has already mastered Pre-Algebra. This is good for middle and high school levels, or even as a refresher before college algebra. I know this would have been very useful for me when I went back to school after a number of years away from the classroom. There are no hidden fees. The name says it all, "No-Nonsense." There's nothing flashy or extravagant that could clutter to pages, or be a distraction. Lessons are pretty short. Mr. B can do a lesson in 15 minutes or so. As far as boring and engaging, there's no game like feel or anything like that. This is simply just Algebra. 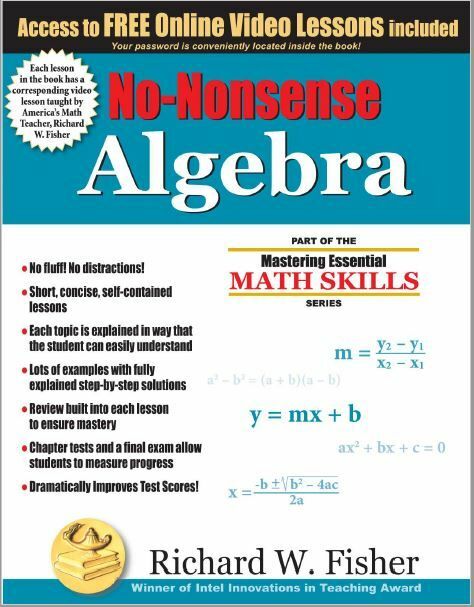 Other members of The Homeschool Review Crew were given copies of No-Nonsense Algebra. Please click the banner below to see what they have to say!